What does 100,000 look like? 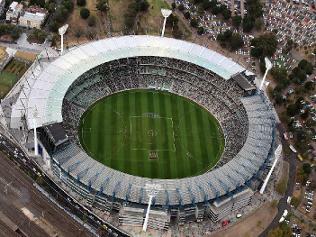 100,000 people can fit into the MCG. Imagine what 1,000,000 people would look like. It would be awesome because from that distance it does not look like a big place and it look smaller then it is. It would be incredible because imagine how man people could fit on the football ground In the MCG lots of people would get a massive big headache from people roaring at the players. It would look like a real famous popular funeral or wedding. It would look like all crowed and all squashed up like any one could even move a muscle. It would look like Michael Jacksons wedding. It would sound like 200,000,000,000,000,000,000,000,000,000,000,000 lions/ tiger roaring ROAR. It would sound like the big sirens going off. It would sound like the football players calling each others names out.It would sound like people crowding for a goal of Michele Jordan last throw EVER.mIt would smell like yummy cook steamed hot dog we misted cease and catchup. I would smell like delicious cooked party pies and sausage rolls. It would smell like sweetly people. It would smell like corn dog cocktails popcorn lots of yummy delightful stuff. It would tasted like yummy cook fried chip, party pies, sausage roils, corn dog, and cocktails. You would be able to tasted your dirty yuck,sweaty( yuck yuck yuck yuck wwww) You can see yummy sorts of food. You can see the loud sirens beating. You can see the football players playing. You can also see the footy players tackle each other. You can see people it there yummy food. You can see the blue seat where there biggest football kick was.